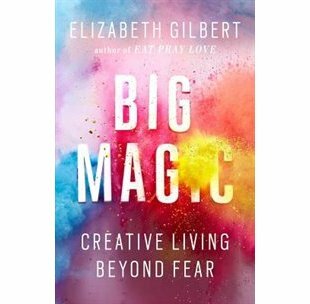 I just finished Elizabeth Gilbert’s Big Magic. If you are interested in the creative process it's an interesting, fun read. Elizabeth was made famous with her blockbuster memoir and later a movie Eat, Pray, Love. I heard her speak after that success here in Toronto. Her TED talks are here if you would like to listen. She is funny and engaging in person as well as in her writing. So why do we want to be creative? Elizabeth says "A creative life is an amplified life. It’s a bigger life, a happier life, an expanded life, and a hell of a lot more interesting life." I totally agree. There is some New Age sensibility in this book, which I'm sure will be criticized by some readers. I felt it was balanced by her pragmatic approach to simply getting the work done, as well as her discussion about dealing with real failure and the fear of failure that haunts many creatives. Her simple joy in writing and her sense of gratitude for what being a writer has brought to her life is inspiring to any creative soul. Elizabeth shares that ultimately she writes for her own pleasure and I think that shows in the end result. She recommends that you please yourself by simply following your own interests and curiosity. I can do that!